Pangolin Mi Bo has seen better days. He arrived at a rescue centre in Vietnam missing a paw after it was cut off in a snare trap. The rest of his body is marked by red lacerations, and he will probably never regain enough strength to return to the wild. But he is among the lucky ones. 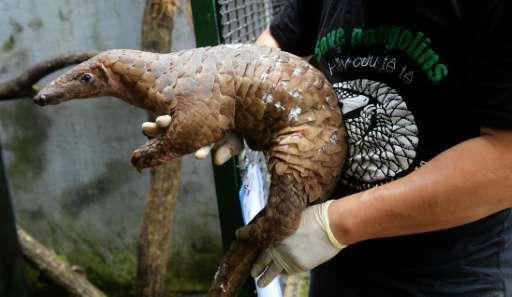 Rescued from poachers, Mi Bo and dozens of other pangolins are being nursed back to health by Vietnamese conservationists fighting to save the scale-covered creatures from extinction. An estimated one million of the animals, often called "scaly anteaters", have been plucked from Asian and African forests over the past decade, shunting them onto the list of species at the highest risk of extinction. About the size of a small dog, pangolins are defenceless in the wild, curling up into a ball when they are scared, allowing poachers to easily scoop them up. Their dire predicament will be on the agenda at a major wildlife conference opening in Hanoi on Thursday, which will be attended by Britain's Prince William—a champion of better-known endangered species such as elephants and rhinos. 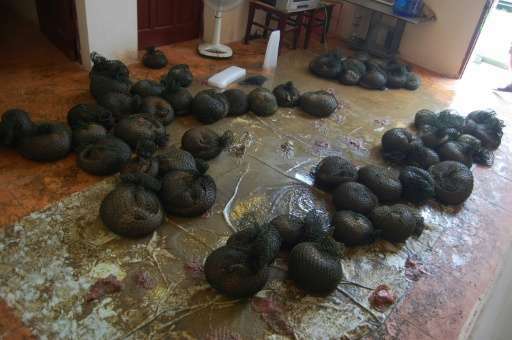 At the rescue centre in Vietnam, a team of staff and volunteers work late into the night to keep the latest batch of nearly 60 pangolins alive. "They have a second life here, they're kind of born again," Nguyen Van Thai, director of Save Vietnam's Wildlife, said from the leafy rehabilitation centre in Cuc Phuong National Park southwest of the capital. A previous group of rescued pangolins arrived barely alive after being stored on ice by poachers who thought it would keep them fresh. Others have been stripped of scales or pumped full of fluids to make them look fatter to prospective buyers. 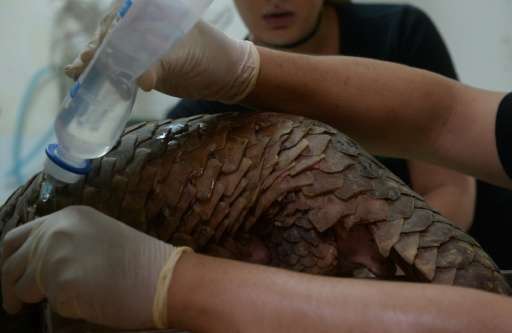 The sorry state of the animals leaves no shortage of work for veterinarian Lam Kim Hai, who treats up to 10 pangolins a day. 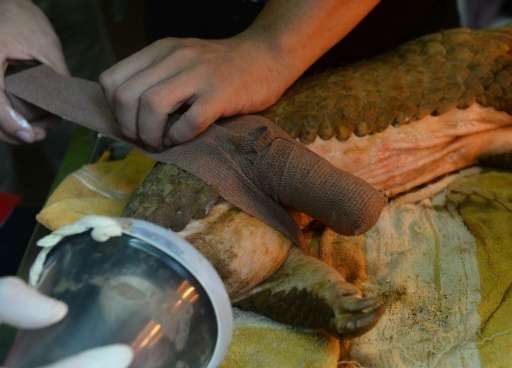 "I feel at the same time sad and angry," the 24-year-old told AFP after treating Mi Bo for over an hour under a heat lamp. Although the pangolin trade is illegal in Vietnam and they are in the government's "red book" of endangered species, law enforcement remains weak. Authorities have even been caught selling the endangered animals after seizing them from poachers, according to media reports. With a booming traditional medicine industry, Vietnam remains both a destination and source country for illegally poached wildlife. Pangolin flesh is also prized. Like in China, their meat is steamed, boiled or grilled. It is eaten on special occasions or to grease business wheels, mostly among members of Vietnam's growing wealthy class willing to spend as much as $1,000 for each creature. "I don't care if it's name is mentioned in the red book. Whenever I have guests or partners who want it, I absolutely have to obtain it for them," Vu Trong Phat, a 45-year-old real estate and construction boss, told AFP at a local pub. At that price, nothing goes to waste. Customers often drink their blood, and their scales are used in special elixirs believed to cure anything from impotence to menstrual cramps to asthma and even cancer. The scales have also been used as guitar plectrums. "Pangolin meat is very delicious and nutritious and very good for your health," said government employee Nguyen Van Thinh, 56. "Pangolin scales are... very good for heart and blood circulation diseases. Any woman who has no milk for her child can be cured just with a small quantity of the medicine," he told AFP at the pub. 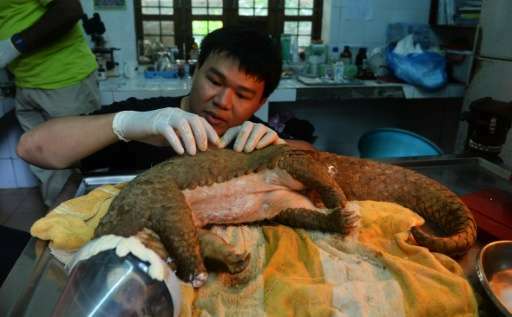 He shares that belief with many others across Vietnam and China, though there is no scientific evidence for any of the supposed medical benefits of pangolin products. Scientists don't know how many pangolins are left in the wild, since the nocturnal and notoriously shy animals are difficult to track. But experts say the size of illegal pangolin hauls in Asia has grown in recent years—in 2015, two tonnes of dead pangolins from Nigeria were found in a single seizure in Hong Kong. With wild populations plummeting, some fear that traders may be seeking to set up breeding farms—which conservationists fear are just a cover for black-market trafficking. Pangolins are also difficult to keep alive in captivity and breeding farms would not necessarily boost their numbers. "That is not a conservation solution, it's nothing we would support. It seems to be just kind of a way to aid and abet the (illegal) trade," John Baker, managing director of WildAid, told AFP from California. 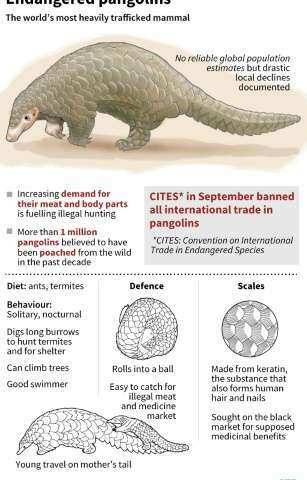 The Hanoi conference follows a decision at a Convention on International Trade in Endangered Species of Wild Fauna and Flora (CITES) summit in September to include pangolins on its "Appendix 1"—the highest level of protection that outlaws all trade in animals facing possible extinction. Thai, the 34-year-old director of Save Vietnam's Wildlife, said he has watched in dismay as pangolin numbers have fallen through the floor. "It's really sad, it's like over 20 years later and there are no pangolins in this area. We need to take action," he said.